Can Dogs Eat Apples & Apple Cores? Are Apples Good or Bad for Dogs? Today’s question: can dogs eat apples? Scroll down for detailed answers. Apples are a great food to enjoy both people and dogs. The fruit is a whole fruit, relatively non toxic (when the core is removed) and with a long lasting freshness compared to other fruits. The apple can be portable as well as versatile. You may bring an apple with you most anywhere, and you are able to offer an apple to your dog most anywhere your pup travels. The versatility of the apple is also a bonus. You may eat the apple whole, sliced, chopped and diced. The apple may be put into a pie, bread or muffin, or even pureed and placed upon another food. Dogs are able to enjoy the apple as well, making the purity of the apple beneficial to the loyal companion of your dog. A dog may like to have an apple as a snack, similar to eating a bone, or you may puree an apple and mix the puree in with the kibble. There are many ways in which to feed your beloved dog an apple. No matter the size, breed, or chewing ability of your pet, there is a way in which your pup may benefit from the apple. 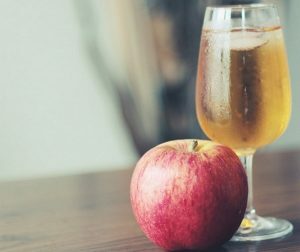 We all know that, for humans, an old wives tale states that just one apple consumed every day will keep the doctor away. The apple is also very nutritionally valuable foods for humans; being filled with fiber and vitamins. But is this the same for dogs? Will an apple a day keep the vet away? Do dogs like apples? Will apples upset your dog’s stomach and be more trouble than it’s worth? Can Dogs Eat Dehydrated Apples? Can Dogs Eat Apple Skin? The answer is yes. Your pooch may enjoy some of your apple slices. Apples are healthy and offer great nutrition for your pooch. However, just with any human food, moderation is key here. If your dog consumes too many apples, he/she may experience stomach problems. Apple seeds contain amygdalin that has cyanide which is toxic to dogs if ingested regularly or in large quantities. When the seed covering breaks, this is where it becomes the most dangerous. Remember to remove the seeds first before feeding apples to your pet. Many of us with apple trees in our gardens will often see the dog playing with and chewing upon the fallen apples. A dog clearing your yard of excess apples is okay. Apples are incredibly healthy for dogs. They are a cheap and healthy treat, filled with vitamins A and C, and lots of dietary fiber. In the event your dog may be eating more than his/her fair share of apples from your tree, you may wish to consider fencing the tree and monitoring the apple intake. If you feel your dog may have eaten too many apples, or has ingested seeds, be sure to contact your vet to be sure the quantity of apples eaten is safe for your particular dog. For younger dogs as well, apples are beneficial for their antioxidants and vitamin C, which some vets believe help with degenerative conditions like joint disease, and fiber, which prevents gastrointestinal diseases. Apples may be the fountain of youth for both dogs and their owners! Apples make a low protein but high antioxidant snack for dogs. Older dogs, or dogs with specific dietary requirements, may need to reduce their protein intake while maintaining other nutritional elements. Antioxidants are also a good preventer of cancer, which is more common in older dogs. If pups are given apples and have extra antioxidants throughout their young lives, the dog may grow to with stand any potential developments of cancers and disease. While this fact is not scientifically proven, there is good cause to believe in this theory and surely would not hurt to try. But it should also be noted that, as with any food, apples should be given in moderation. Apples should be used to supplement smaller portions of their normal food, provided as a snack, rather than a staple. They should also be introduced gradually. Apples have a high acidity content, which if over indulged on can upset your dog’s stomach. Seeds should also be removed frequently. The seeds are not hazardous in an immediate way, but because they contain cyanide. Over time, cyanide may build up and this build up can accumulate and become dangerous. A fun fact many are unaware of with apples is that apples offer a similar benefit to brushing your teeth. In the event you are without a toothbrush, eating an apple can help clean your teeth, remove bacteria, and freshen your breath. Dogs that eat apples may benefit from this mouth cleaning as well! Some of you are overly enthusiastic about kissing your dogs and having them lick your entire faces, including your mouth. 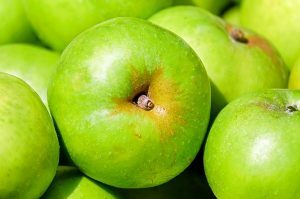 For those of you who enjoy that, but dislike the smell of your dog’s breath, like a non-smoker in love with a smoker, apples help to clean the residue off dogs’ teeth. Biting into an apple helps to freshen your pup’s breath, so you will not have to pop a mint in her mouth every time you go for a kiss. Even though, apples have many benefits, there are some drawbacks as well. The main thing you should be cautious about is making sure that the apples don’t contain any seeds. It’s easy to remove the seeds to make this delicious snack safe for your pet. Moreover, avoid feeding your pet too many apples at one sitting. Too many of these fruits can cause upset stomach. Additionally, avoid feeding your dog the apple core. Apple pips have traces of cyanide. If your dog happens to swallow couple of seeds, don’t panic. Your pet’s body can detoxify itself and he/she will most likely be fine. However, regular intake of apple seeds can cause a cyanide build-up and that can become dangerous for your pooch. 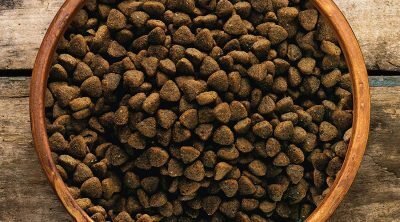 A few seeds here and there won’t harm your dog, he/she would have to ingest plenty of them to get sick. Still it’s best to be on the safe side and remove the core with the seeds altogether before feeding apples to your dog. 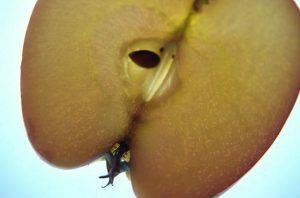 Dogs with kidney disease should not eat apples since its calcium, phosphorus, and high levels of omega-6 fatty acids can cause them some health issues. Moreover, caramel apples, or any other type of dip upon an apple, should be enjoyed only by humans, and kept away from your pet. Apples on their own are a fine treat to offer your pet, but adding sugar to the apple is unnecessary and harmful. A small amount is fine from time to time. Dehydrated apples do contain nutrients but they lack water which is needed for digestion. So dehydrated apples can cause stomach and digestive issues. Don’t give too many of these treats to your pooch. Apple juice contains too much sugar and is not meant for canine consumption. It’s better to give your pooch some fresh apple pieces instead and ditch the juice. Sticking with raw plain apples is the safest way in which your dog can enjoy the nutritional values. Excess sugar in the diet will cause weight gain and possibly diabetes. Diabetes in dogs is also common enough, and so the same rules apply to apple juice or any other sweetened apples, like candy or chocolate covered apples. Yes, dogs can eat apple skin. Apple skin is actually very nutritious, most vitamins and fiber is in the skin. So if you want your pooch to reap all the useful benefits of apples, leave the skin on. No need to cut it off. Most dogs have no problems of digesting the skin. 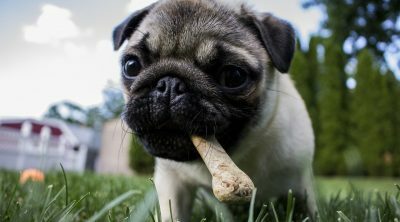 Yes, you can give your puppy some apple treats as long as your pup is old enough to digest solid foods. 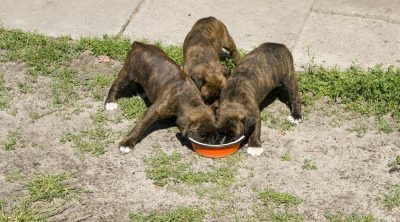 Puppies that are younger than 6 months old should be eating special puppy food according to their age and needs. If your puppy is older than 6 months old, you can safely give him/her apple slices. However, remember to observe your pet after feeding him/her apples. 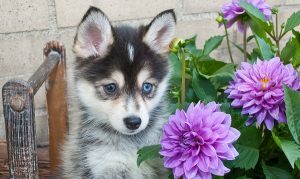 You want to make sure that your pup is actually able to digest the fruit without any problems. Make sure to slice the apples into small bite-sized treats to prevent choking. Preparing apples for your furry buddy is quite simple. It’s recommended not giving your dog whole apples. He/she may accidentally choke on a big piece or ingest the seeds or stem which are not safe. It’s best to buy organic apples to avoid pesticides which are equally harmful for your pet as well as they are for you. However, if you are not able to get organic apples, wash the apples thoroughly to get the toxic residue off the fruits. After that, cut the apples in small slices and offer them to your pet. You don’t need to cut the skin off since that is where most of the fiber and the beneficial nutrients are. Remember, not all dogs like apples. Dogs are unique in their own way, some may find apples fun, tasty, and crunchy treats, others may dislike the taste or texture. If your dog likes apples, you can give your pooch plain apple pieces as treats or mix a little bit of apples into his/her regular dog food. Just don’t overdo it. When introducing apples to your dog’s diet, do it slowly with small amounts first. Monitor your pet afterwards for any unusual symptoms such as digestive problems or loose stool. Like stated above, start introducing apples gradually into your pet’s diet and remember to monitor your dogs reactions after the feeding. 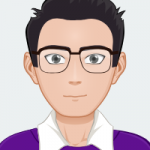 Moreover, don’t give large amounts of apples to your dogs, small bite size slices are best for them (without the seeds). If your dog accidentally has eaten too many apples, he/she is expected to experience diarrhea or even vomiting. It’s recommended to consult with your veterinarian for proper treatment. In the meanwhile, monitor your dog for an upset stomach or any allergic reactions. If your dog has loose stool, you may want to place him outside (if possible) so it would be easier for you to clean up after him/her. Also, make sure that your dog has drinking water available at all times since he may get dehydrated. If your dog’s condition has not improved in 24 hours, you should take him to the vet. A dog will generally eat anything. 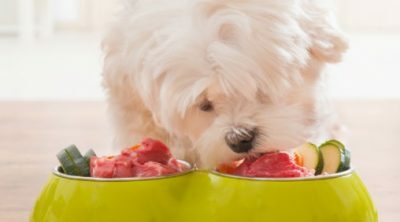 Dogs especially enjoy eating the foods their master enjoys. Dogs are the oldest domesticated animals and as a result they are uniquely aware of and sensitive to human behavior. 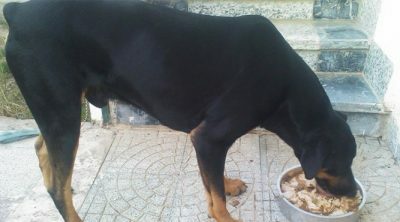 A study in 2010 provided interesting evidence that showed when a domesticated dog is presented with a task it cannot complete or understand it will look to its owner. A wild and socialized wolf will not. Thus, domesticated dogs have their owners solve their problems for them. When a dog sees his/her owner enjoying apples and other fruits, the dog may view these treats as special foods for him/her to enjoy as well. So if you are new on the dog scene and wondering about the possibility of feeding your dog an apple, go for it. Thanks to modern science and dietitians, we also know the nutritional benefits of the humble apple. We know how good they are for us, and we now know that they are, in moderation, good for our canine buddy. Apple flesh is not poisonous and doesn’t have any toxins that is dangerous for dogs. The only danger potential within an apple is the core and the seeds of the apple. The core may be a choking hazard if swallowed whole, and the seeds within the core contain cyanide which is toxic to dogs if eaten in excess. The core and seeds of any fruit should be removed to prevent choking and potential blockages in your pet. We now know more about apples than ever before. And with our already extensive knowledge on our canine friends, we can share another wonderful treat in this humble harvest yield. Yes, it’s true: dogs can eat apples. Just remember to serve apples to your dog in moderate amounts. Even though apples are healthy and nutritious, you shouldn’t feed them to your pooch anytime you want. 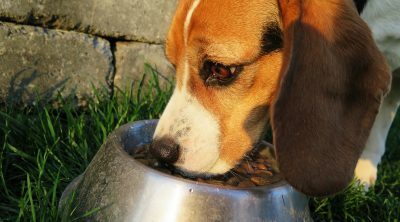 Like any other human foods, too much will cause health issues to your canine.